After the form has been designed, format and validations to the fields should be applied, to which the data being added in the fields should be of compliance to. Validations conforms to the data requirements and make sure that the data being entered into the fields is correct. Add validation to a field by (1) Selecting the field, where validation needs to be added and (2) Press Edit Selected Item. This will (3) Open Edit Bean for the selected item. (1) Name (Text Field): Represents the name of the field. (2) V. Alignment (drop down): Field is used to set vertical alignment of the data being entered in the field. (3) H. Alignment (drop down): Field is used to set vertical alignment of the data being entered in the field. 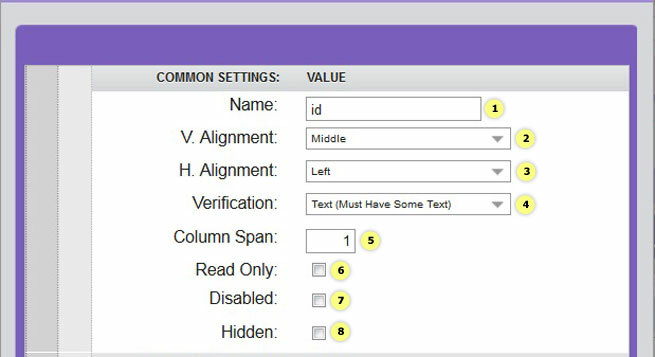 (4) Verification (drop down): Field is used to set validations such as whether the field accepts the data in Text, Integers, Decimals or in any other format. (5) Column Span (text field): Column Span is used to extend the size of the field to as many columns as required. (6) Read Only (check box): Set the field as Read only, if checked. (7) Disabled (check box): Set the field as Disabled, if checked. (8) Hidden (check box): Set the field as Hidden, if checked. (1) Content (text field): Display whatever has been supplied in the text field as default text. (2) Size (in characters) (text field): Set the size of the field in terms of number of characters. (3) Max characters (text box): Set the Maximum number of characters allowed in the field. (4) Hide Characters (check box): Hide the characters in the field, if checked. (1) Is Relationship (Check-box): Field is used to identify, if the item is a relationship or not. (2) Data Object (drop down): Field is used to set the data object, from where the drop-down field will fill values into it. (3) Display Field in D/O (drop down): Used to set what should be displayed i.e. Name or the ID in the form. (4) Value Field in D/O (drop down): Used to set values on the form. (1) Rows (text field): Set number of rows for multiple text field. (2) Columns (text field): Set number of columns for multiple text field.